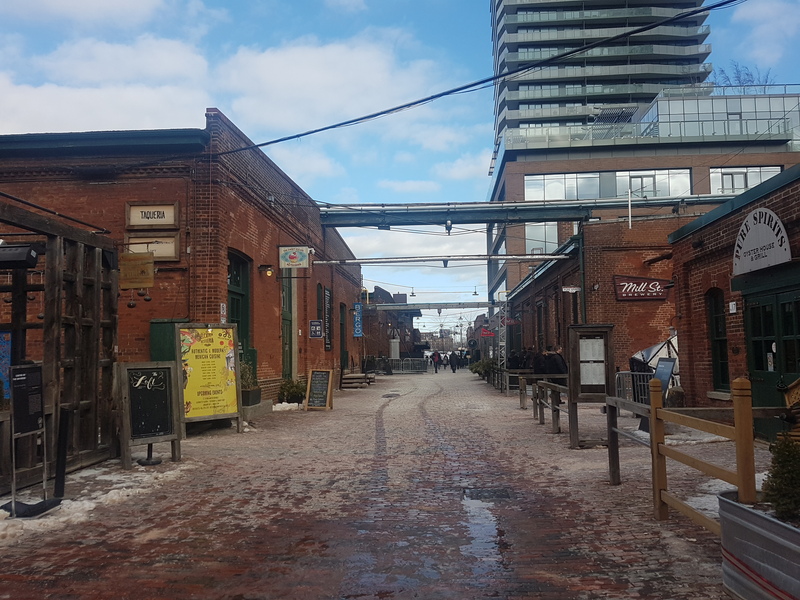 What began as the Gooderham & Worts complex, the Distillery District is associated with a distinct set of Victorian structures that make up its stunning geography. Its story, though, also extends its lost geography. Running through the middle is Trinity Street. 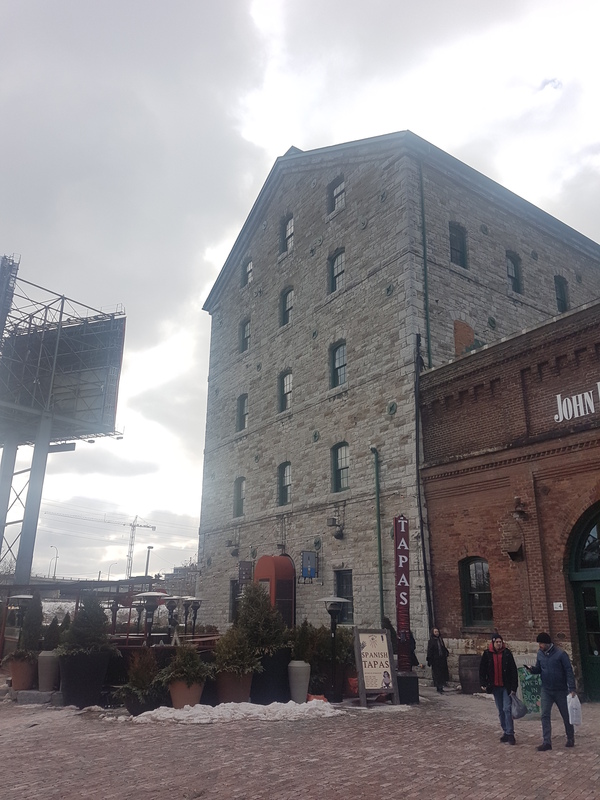 At its foot is the Distillery District’s most recognizable building: the Stone Distillery of 1859. 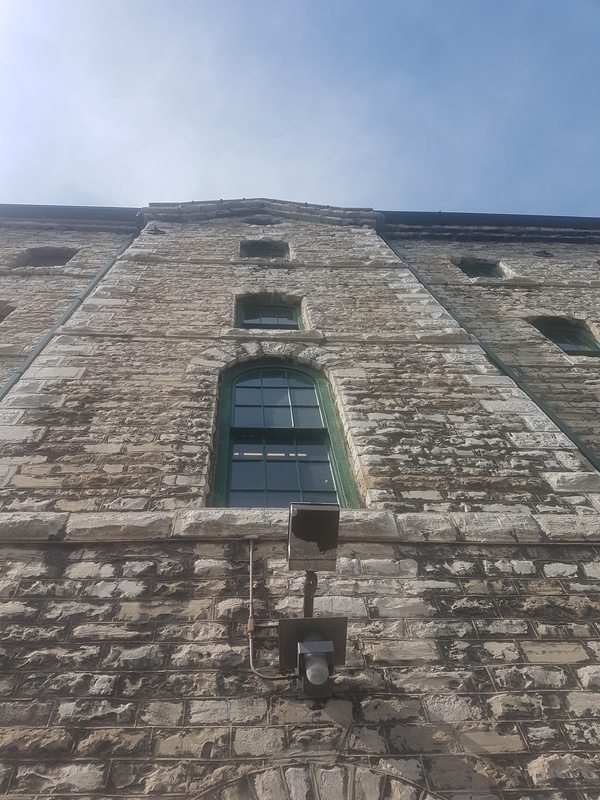 Cut from Kingston limestone, it is the largest and oldest of the existing G&W buildings. 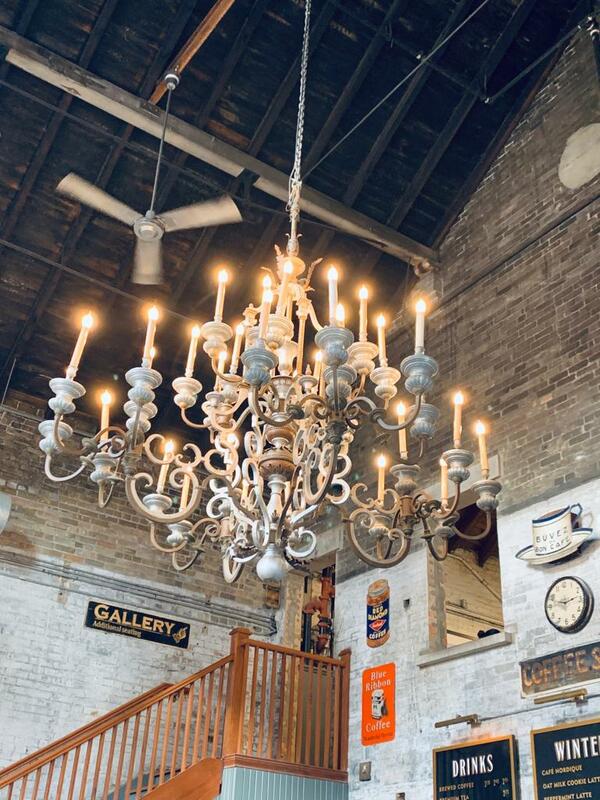 It infamously went up in flames in 1869 — the pressure from the fire blowing the roof off! It was rebuilt again, but several workers perished in the fire and burn marks can still be seen in the brickwork. Rising high on the west side of Trinity Street is the Malt House & Kiln Building and Cooperage Building. 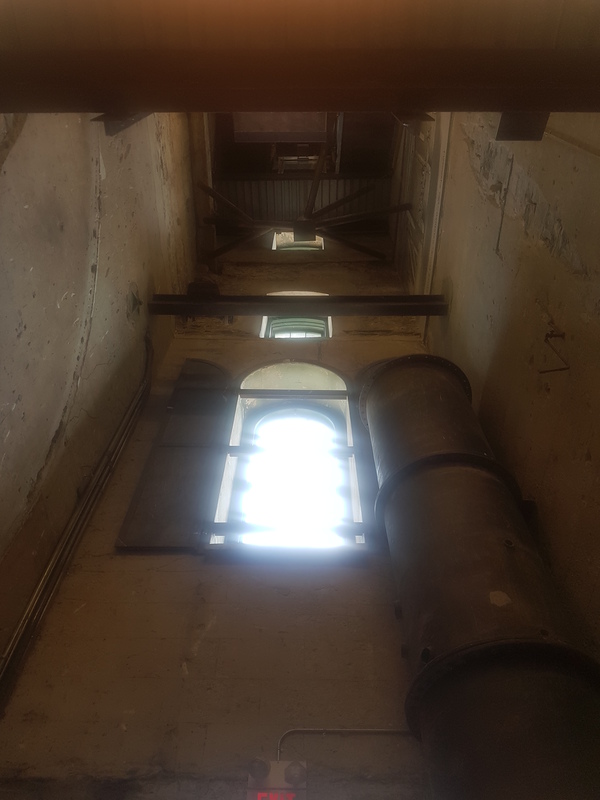 They are most noticeable for the cupola overlooking the area. Gristmill Lane leads into Trinity Street from Parliament Street. On the east side (from south to north) is the Pump House, Pure Spirits and Cannery complex, and interestingly, the old Lunch Room. Along what is now Tank House Lane is, well, a complex of Tank Houses, built to house and age liquor for two years by law. Case Goods Lane houses the Case Goods Warehouse, which is the youngest of the existing buildings (erected in 1927). Its age shows as it looks different than the earlier structures. 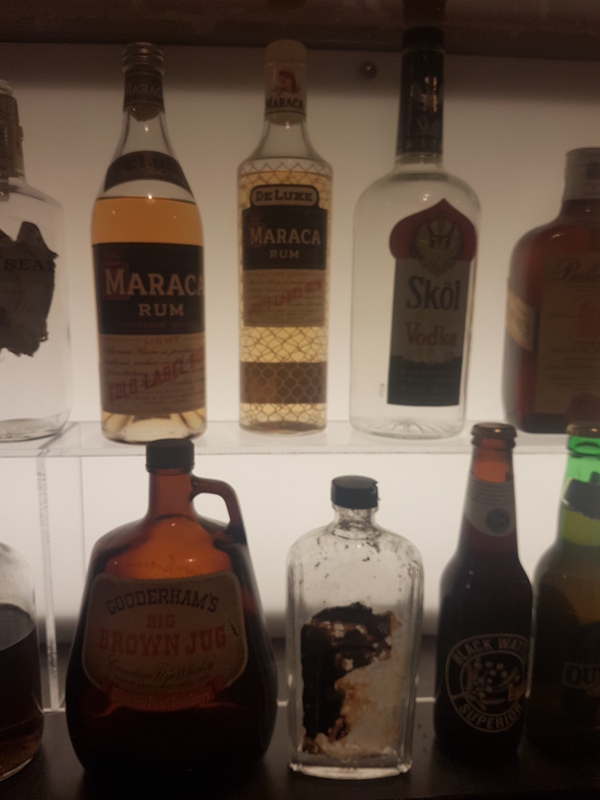 It came when Harry Hatch, a Bridlewood horsebreeder and industrialist, bought the distillery in the 1920s and merged it with Hiram-Walker. 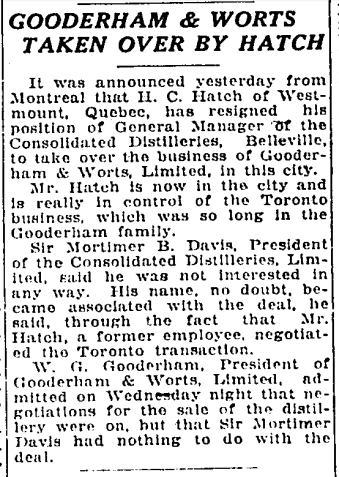 “Gooderham & Worts Taken Over By Hatch” The Globe, December 21, 1923. Credit: Toronto Public Library. 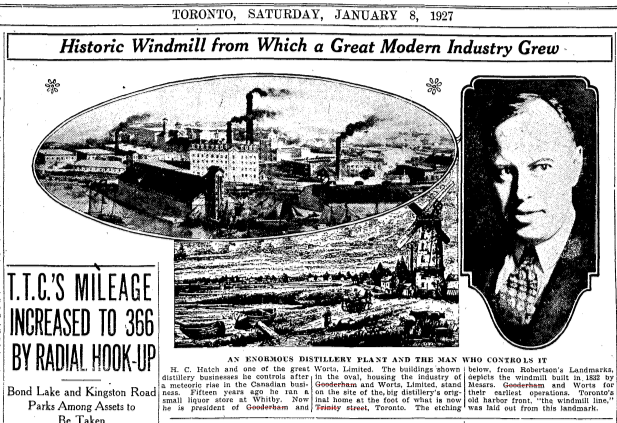 “Historic Windmill from Which a Great Modern Industry Grew” The Toronto Daily Star, January 8, 1927. 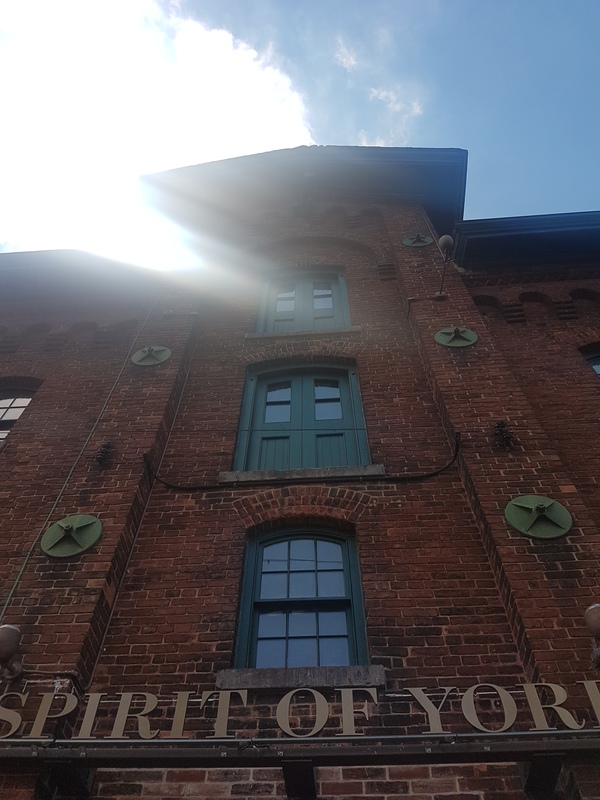 Aside from the Case Goods Building, the Distillery District’s architecture was designed by David Roberts Sr. and his son David Roberts Jr., who were Gooderham & Worts’ exclusive architects and civil engineers. Roberts Jr also designed the company’s headquarters, the Gooderham Building on Wellington Street, and other Gooderham family residences, such as Waveney — otherwise known as the George Gooderham House on Bloor Street. 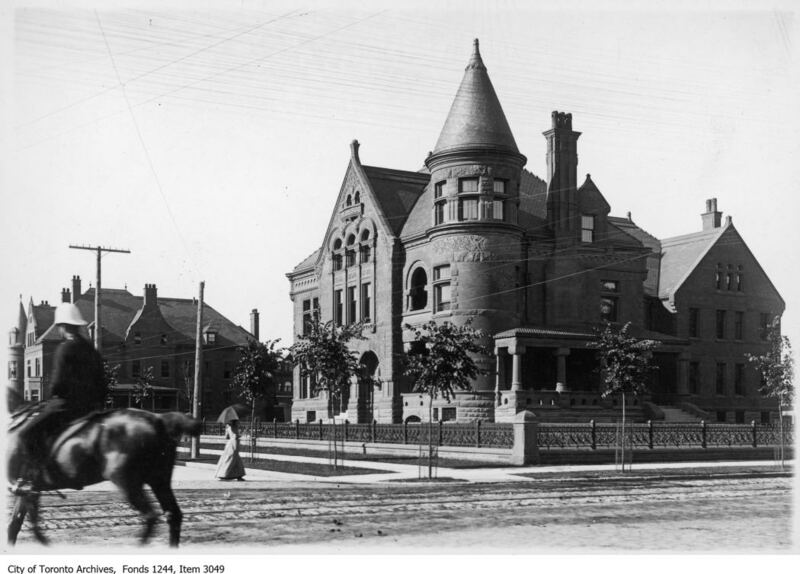 George Gooderham residence, northeast corner of St. George and Bloor streets, 1892. Credit: City of Toronto Archives. 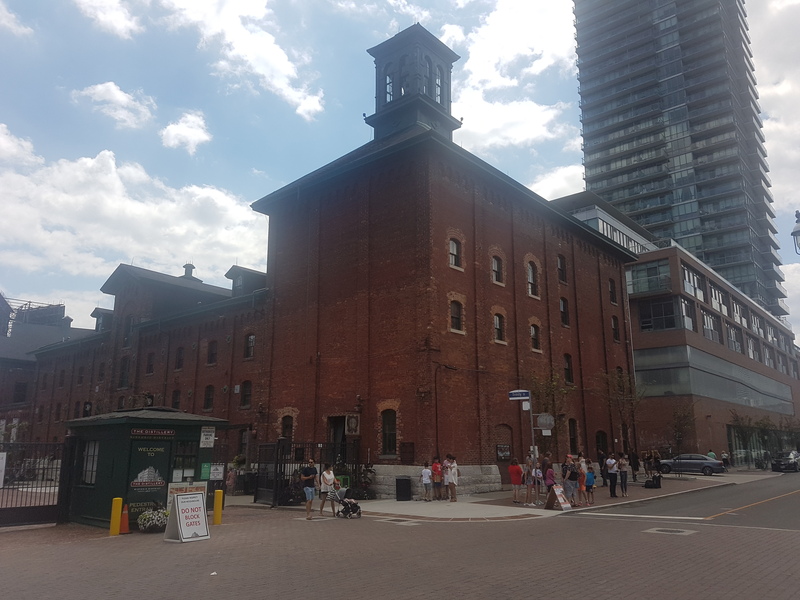 As much as the current building stock is an impressive visual reminder of the history of Gooderham and Worts, the Distillery District’s story also lays in its lost geography too. 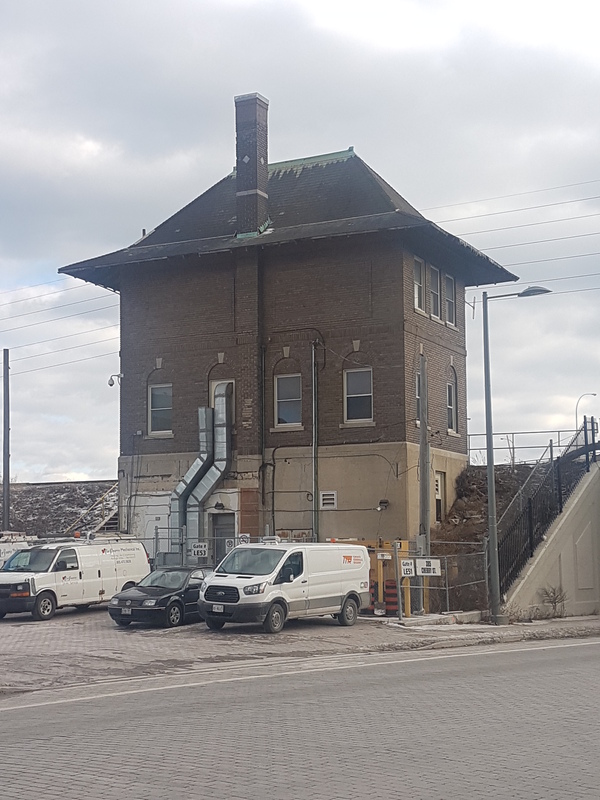 The obvious start is the windmill near the mouth of the Don River, started by William Gooderham and James Worts Sr in 1832. Several years later the gristmill turned into a distillery and was the beginning of an empire. 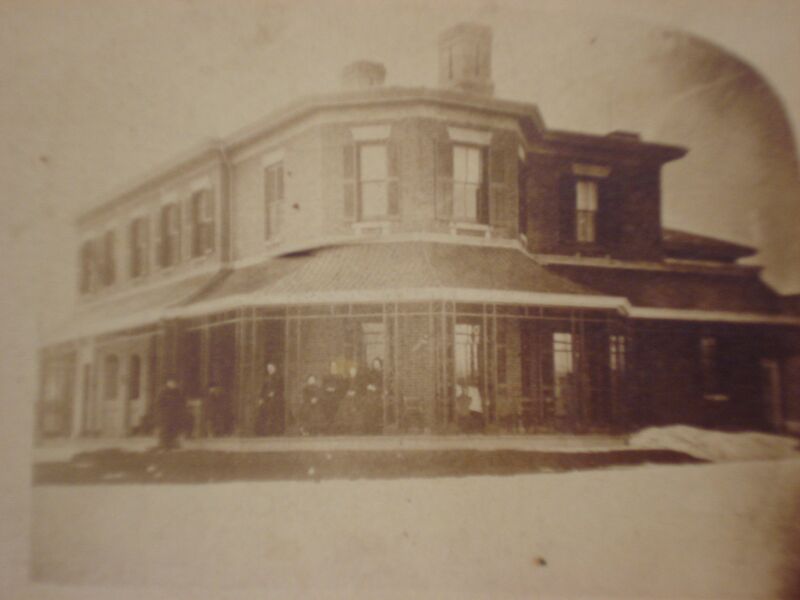 It stood until the 1860s when the buildings on the west side of Trinity Street replaced it. A curved line of bricks in Grist Mill Lane marks where it once stood. In the 1950s, G&W and the York Pioneers (of which the Gooderhams were members) erected a replica windmill on Parliament Street near the Victory Mill Silos. 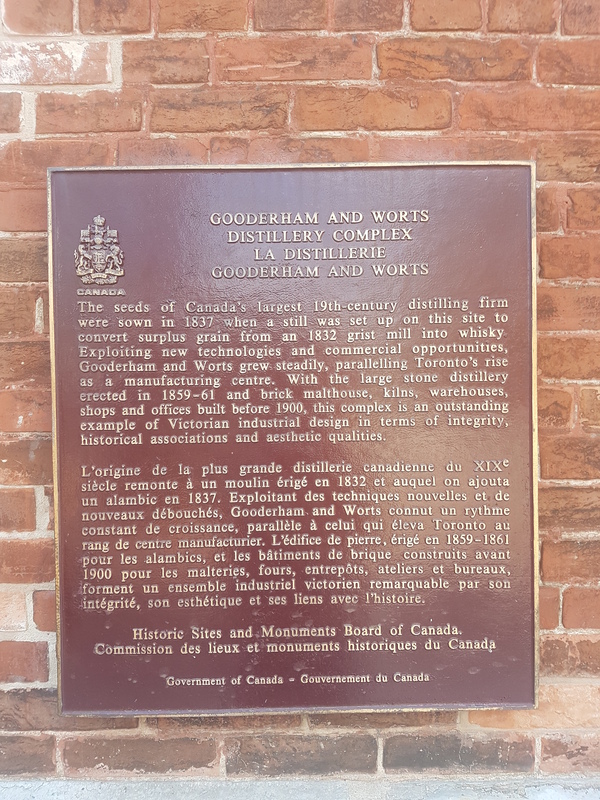 Gooderham and Worts (Toronto, Ont.) Gristmill, 1840s. Credit: Toronto Public Library. 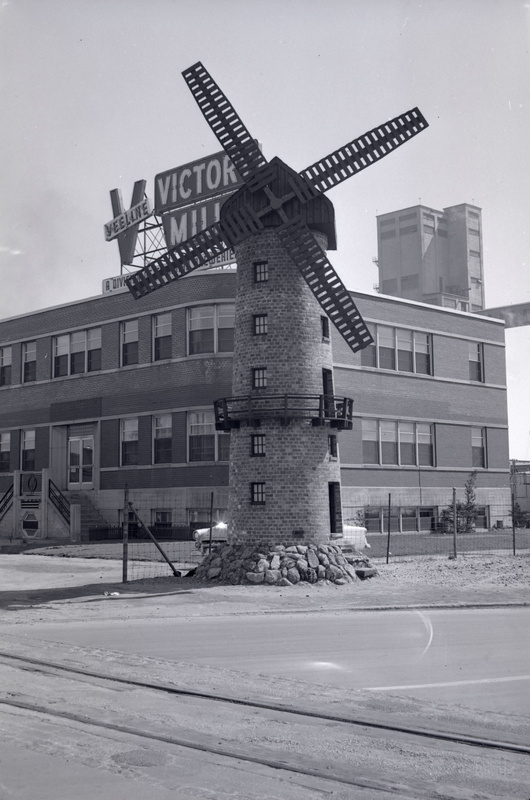 Gooderham & Worts, foot of Trinity St. showing replica of original windmill, 1954. Credit: Toronto Public Library. Aerial showing location of Gooderham and Worts Windmill replica, 1957. Credit: City of Toronto Archives. Another little known enterprise in the Gooderham & Worts empire was a dairy and cattle business. These cow byres were once located on the east side of Trinity Street across the original mill in the 1830s. They relocated east of the Don near the river’s bend decades later. 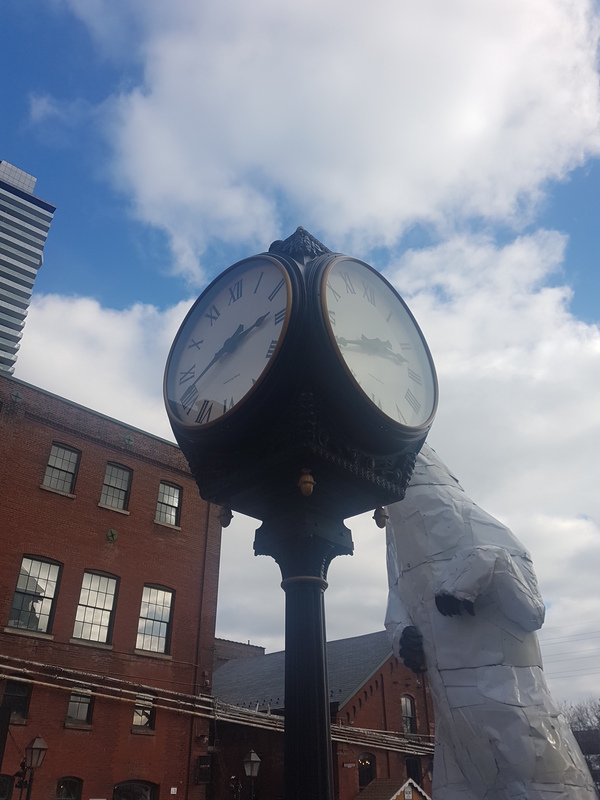 Residents in the east end of the city complained about the ‘intolerable nuisance’ of pollutants G&W were discharging into Ashbridges Bay in the 1880s and ’90s. 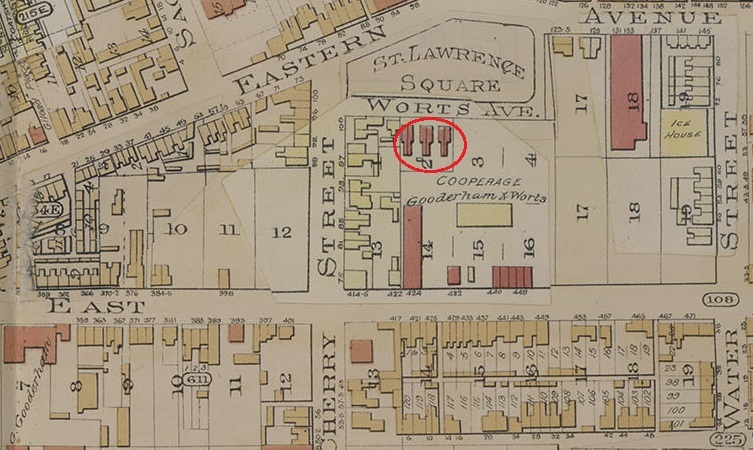 Gooderham & Worts Cattle Sheds from Goads Fire Insurance Map, 1903. Credit: Goads Toronto. “The Marsh”, The Globe, August 21, 1881. Credit: Toronto Public Library. 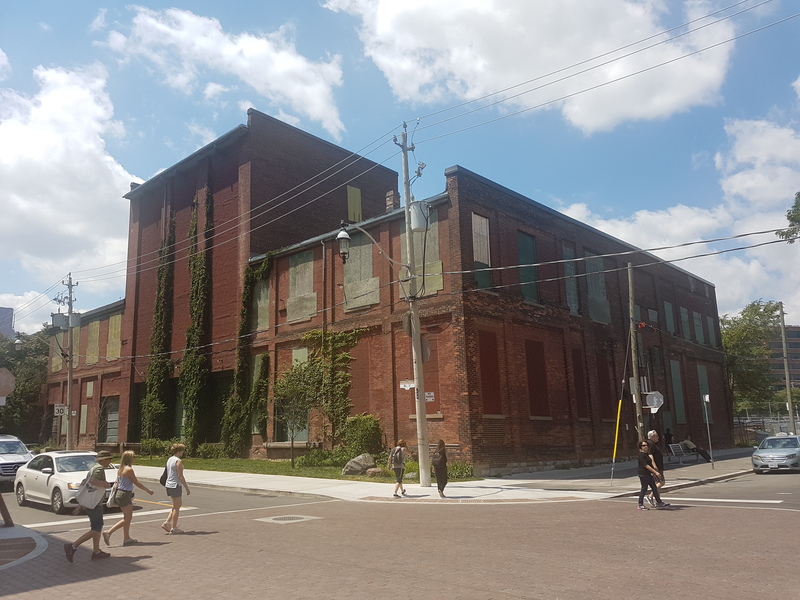 Moving up Trinity Street from Mill Street, there are other lost Gooderham & Worts sites — particularly houses! 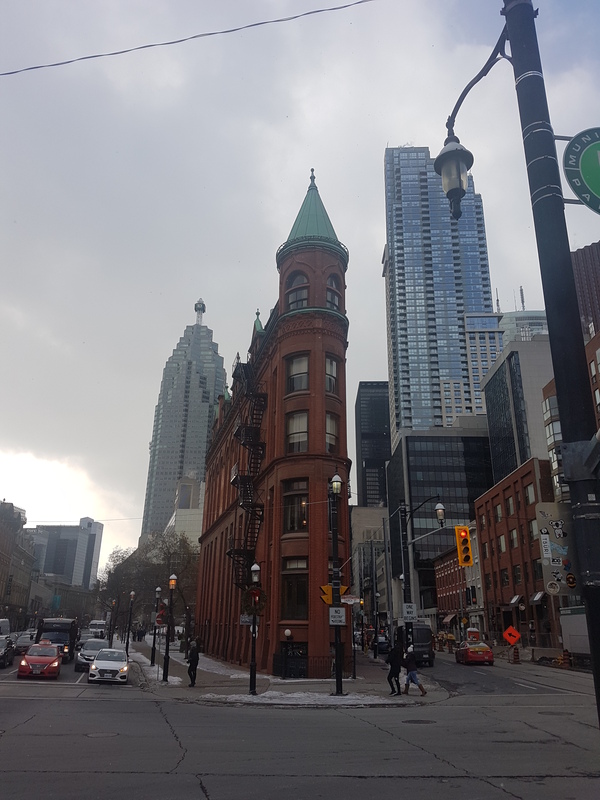 On the northwest corner of Mill and Trinity was the residence of Henry Gooderham, as the 1880 City of Toronto Directories tell us, but was built and lived in by his father William Gooderham himself. A funeral for the man in 1881 ran from the house to his resting place in St. James Cemetery. In 1902, the General Distilling Company — a subsidiary of G&W — replaced the house. Directly across the street was the James Gooderham Worts House, Lindenwold. It was razed for Rack House “D” in 1895. Both warehouse structures still stand. View of Toronto’s Front Street from Windmill to Old Fort from Robertson’s Landmarks of Toronto, circa 1850. The Gooderham house at Trinity Street and Mill Street is on the left. The gristmill and wharf are to its right. Credit: Wikimedia Commons. Lindenwold, 1870s. 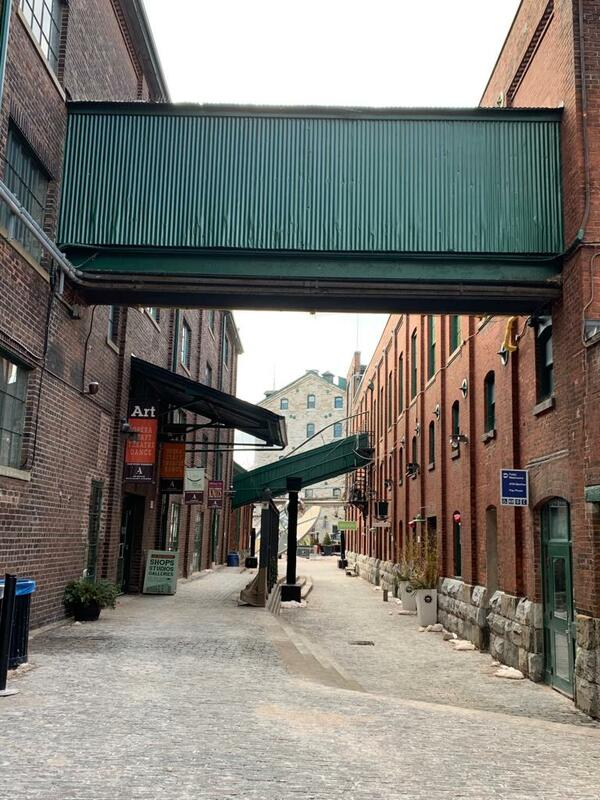 Credit: Distillery District Heritage. On the southwest corner of Trinity and Front was the William George Gooderham house, also as per 1880 City Directories. 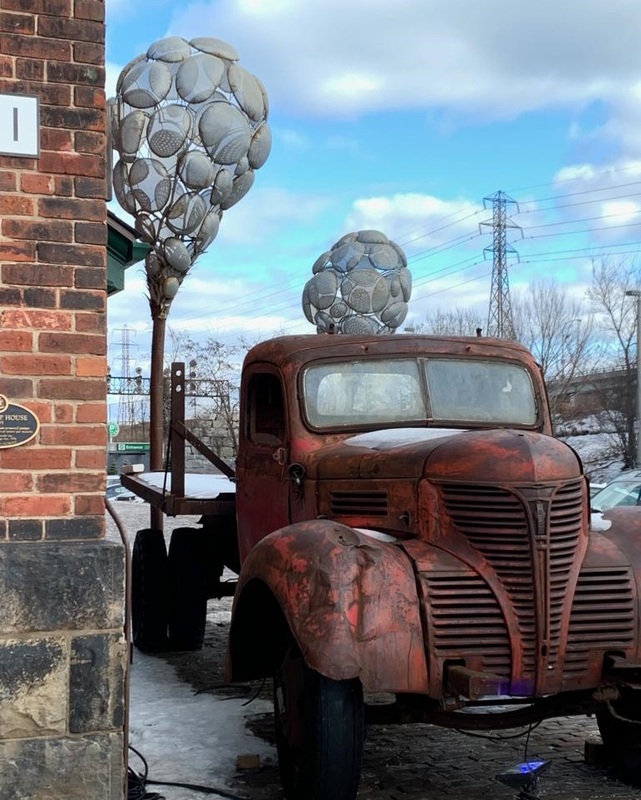 In the first decade of the 1900s, it fell victim to the expanding Consumers Gas Co. Across street on the east side was the residence of his father, George Gooderham, who perhaps lived there before moving into Waveney around 1892. There are parking lots on both sites today. 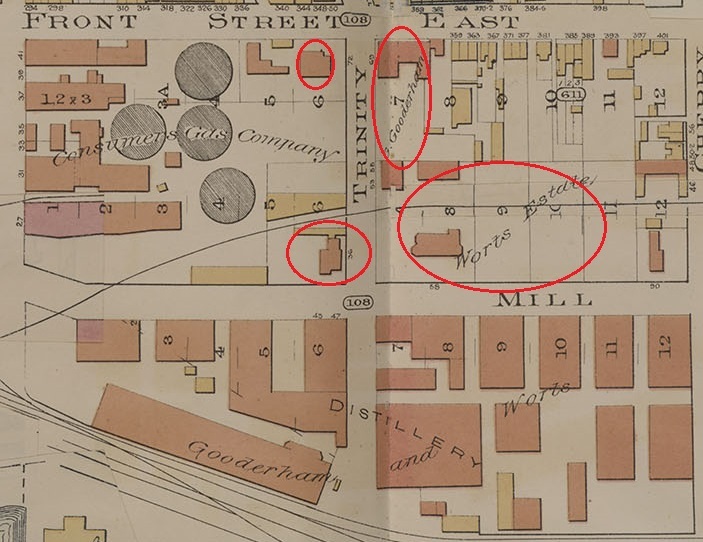 Gooderham and Worts houses in the Goads Fire Insurance Map, 1903. Credit: Goads Toronto. Looking north on Trinity Street, 2018. Credit: Google Maps. 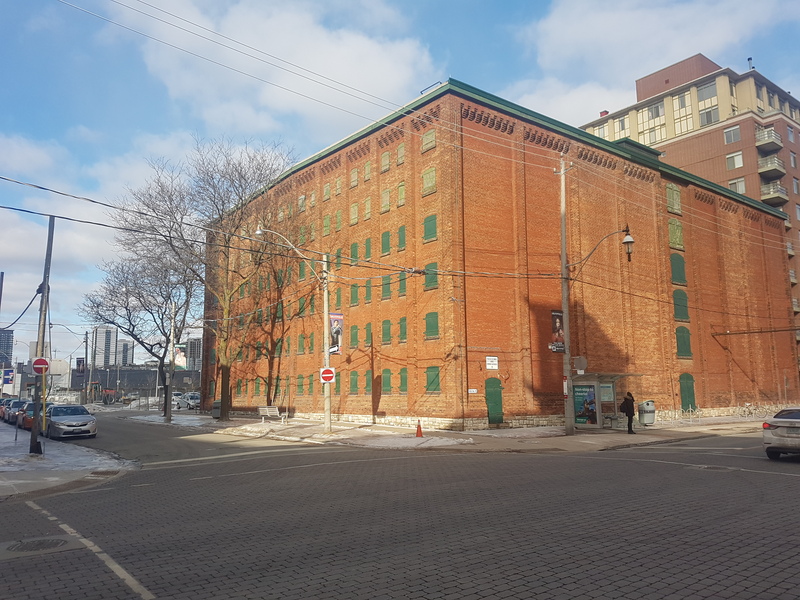 Moving east, the Gooderham and Worts Cooperage once stood on Front Street east of Cherry Street. Bordering the north side of the cooperage yard was Worts Avenue. Worts was originally called Market Street with the name change occurring sometime in the 1880s. George Gooderham had three houses built on the street in 1901. On the north side of Worts was St. Lawrence Square, a oddly situated tract of land shaped by Worts, Cherry, and a bend in Eastern Avenue. 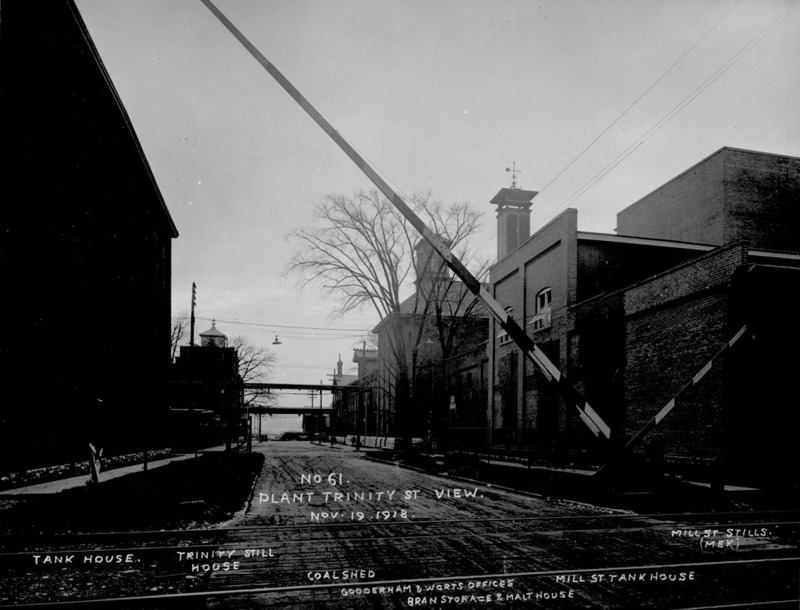 G&W sold their land to the Canadian Northern Ontario Railway in 1906 as the CNOR grew its yards, absorbing the cooperage and St Lawrence Square. 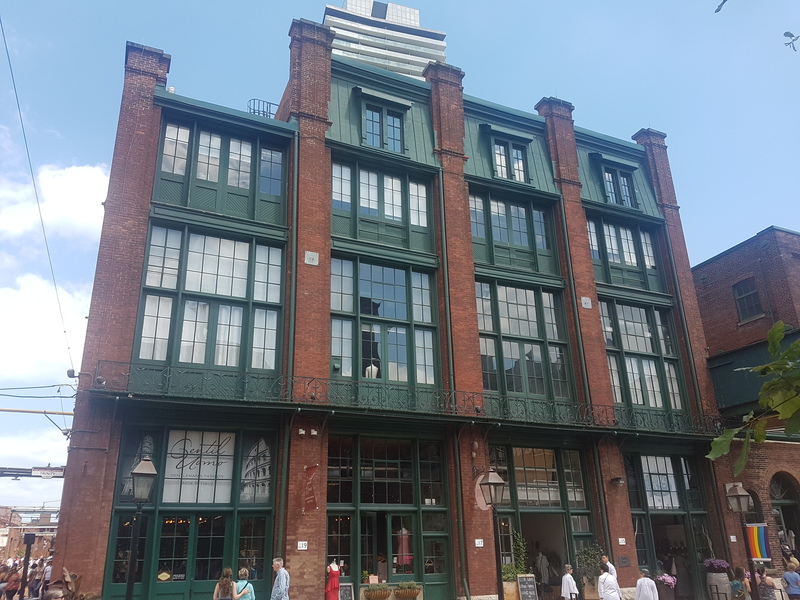 Cooperage Street today pays homage to the history. 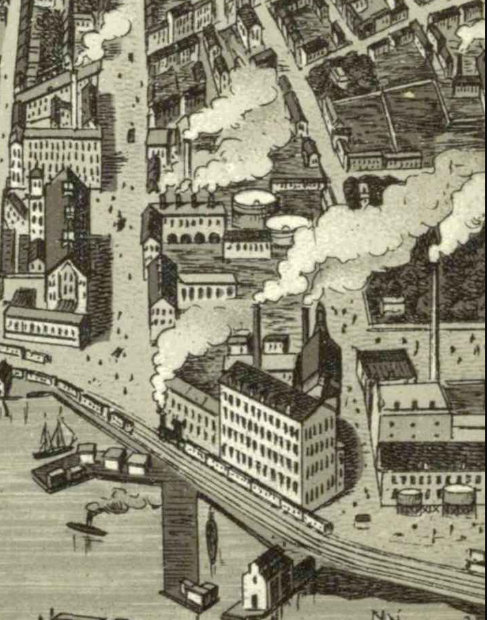 Gooderham and Worts Cooperage in the Goads Fire Insurance Map, 1903. The three houses are hilighted. Credit: Goads Toronto. Cooperage Street & Front Street, 2018. Credit: Google Maps. 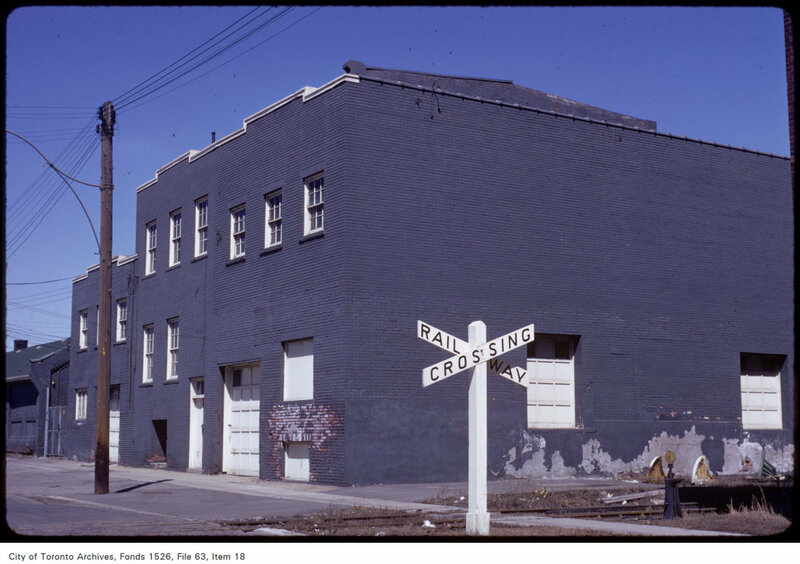 The Canadian National Railway’s expansion also absorbed several residential streets including Water Street and Tate Street, whose residents were labourers at the railroads, G&W, the Toronto Rolling Mills, and at the William Davies Co. With the recent redevelopment of the area to what is now the West Don Lands, little physical reminders remain beyond some street names. Along with the emergence of the CNOR, there were other railway lines that surrounded the complex. First, the Canadian Pacific Railway curled around the north of Gooderham & Worts, crossing at Parliament Street and Trinity Street. 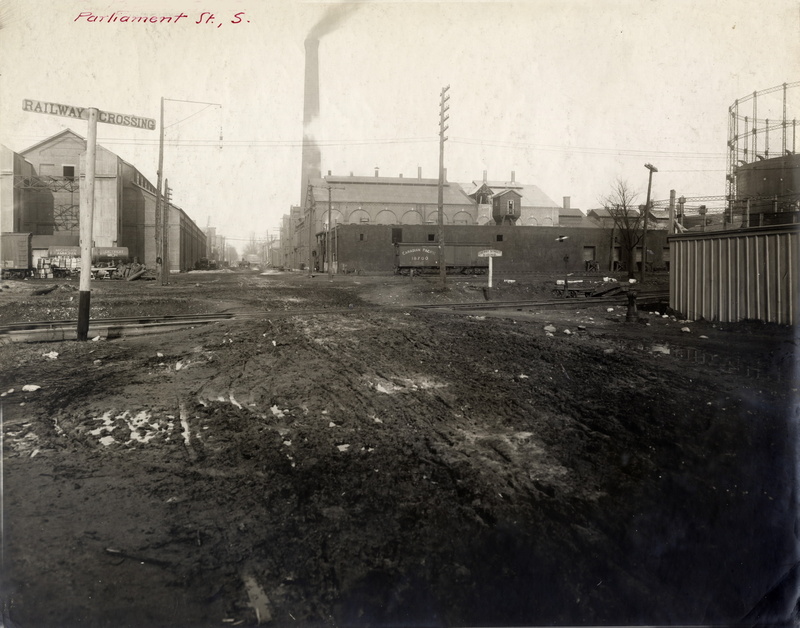 Parliament St., looking n. across Mill St., 1907. Credit: Toronto Public Library. 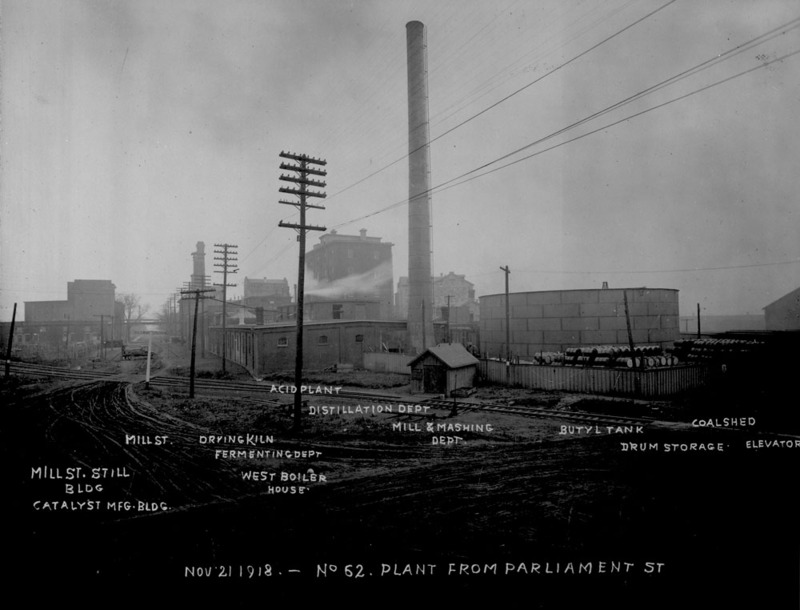 Plant from Parliament Street, British Acetones Toronto Limited, Toronto, Ontario, 1918. Credit: City of Toronto Archives. Parliament Street – old C.P.R. crossing, 1932. The railway ceases to cross Parliament. Credit: City of Toronto Archives. 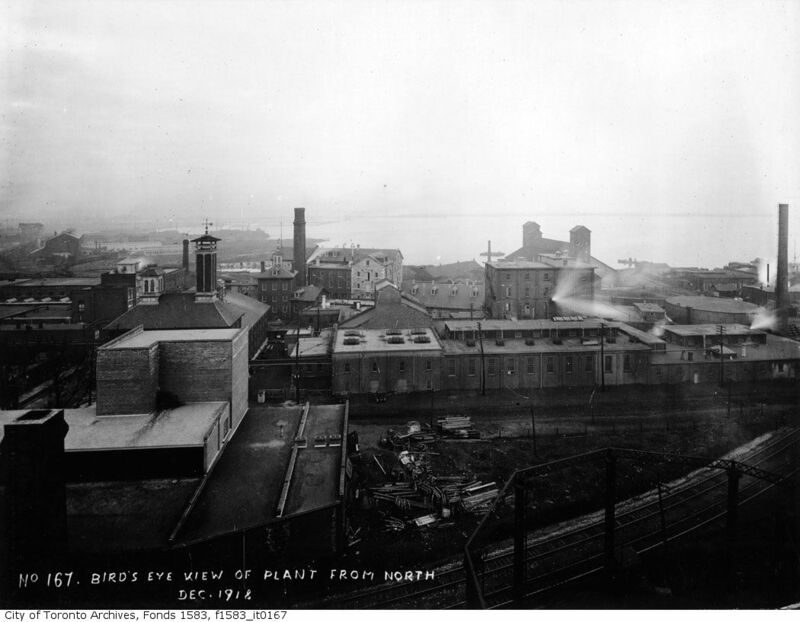 Plant, Trinity Street view, British Acetones Toronto Limited, 1918. Credit: City of Toronto Archives. Railroad, Trinity south of Front, 1971. View is looking north. Credit: City of Toronto Archives. 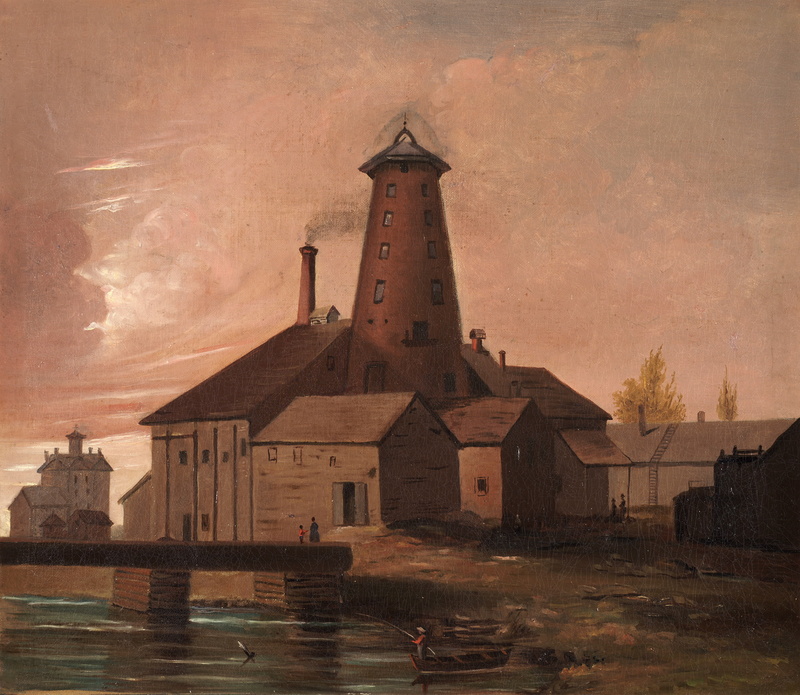 George Gooderham also co-founded the Toronto & Nipissing Railway which he used to transport raw materials from the northern parts of Ontario to the Distillery. 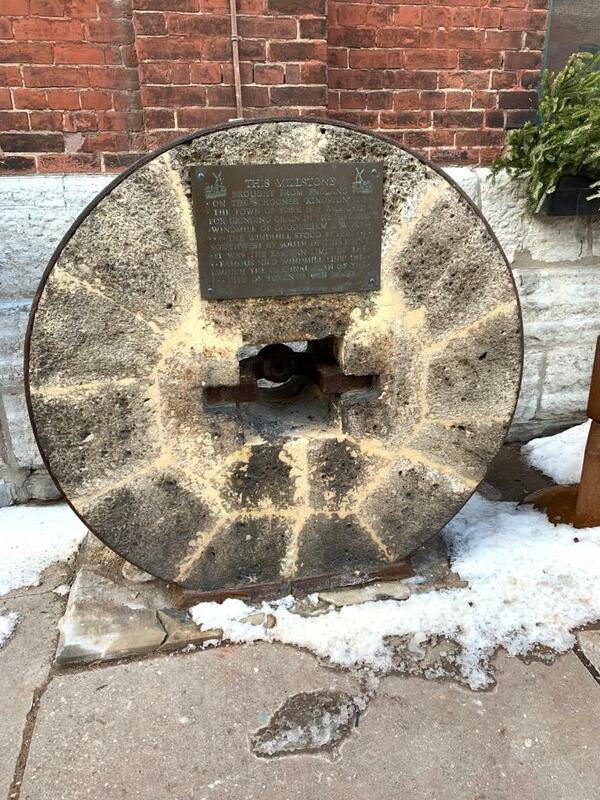 From a train station located in today’s Parliament Square Park, the tracks ran steps away from the Stone Distillery. The T&N Railway was eventually absorbed into the CNR by the 1920s. Part of it is used by the York-Durham Heritage Railway for themed train rides. Gooderham and Worts from Bird’s Eye View of Toronto, 1889. 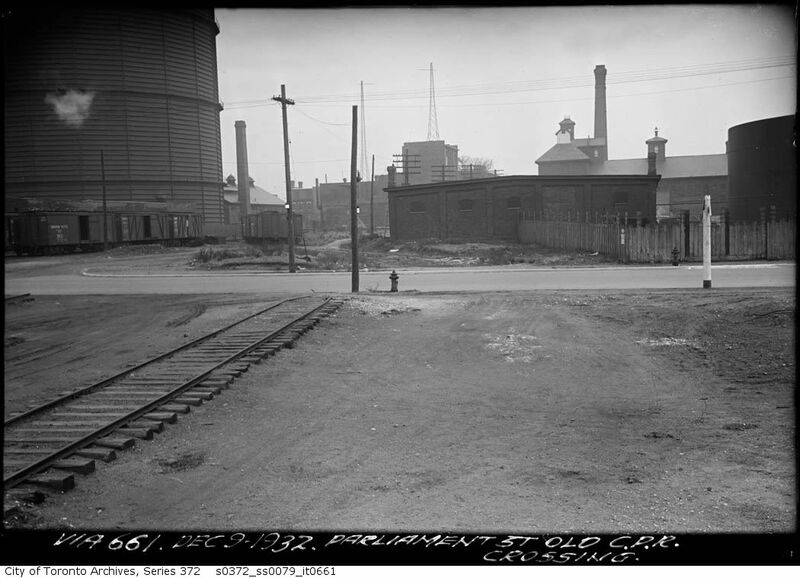 The old Toronto & Nippissing terminus station is located on the left side of the image. Credit: Old Toronto Maps. 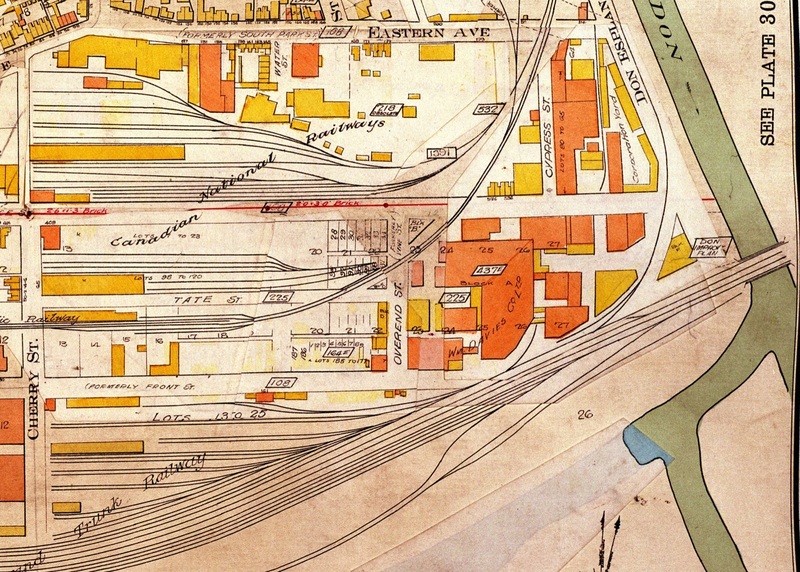 On the same right of way was the Grand Trunk Railway, who also had railyards west and east of the complex. The latter now houses the Cherry Street streetcar loop. The GTR also became part of CNR. Overlooking the loop is the Cherry Street Interlocking Tower which was built here in 1931 to monitor rail traffic within the Union Station Railway Corridor. 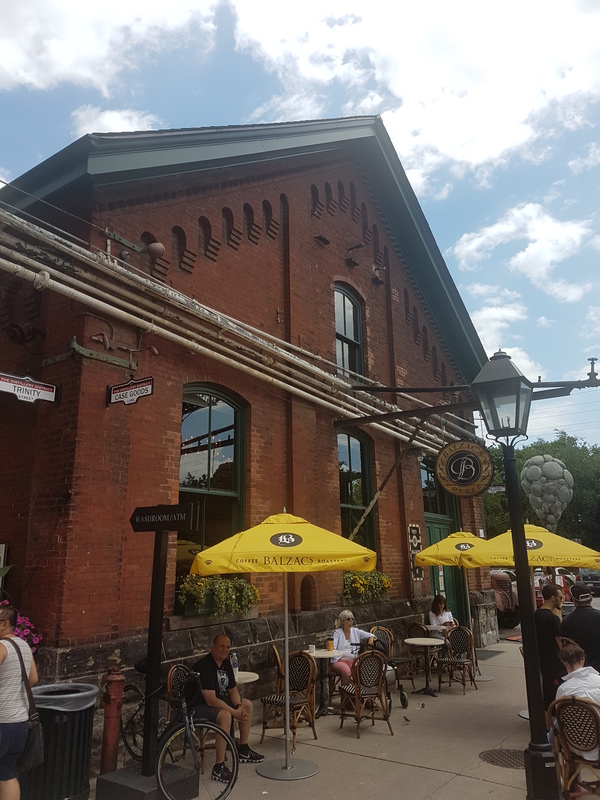 With Gooderham and Worts leveraging the rails in its growth, it also had water at its whim. 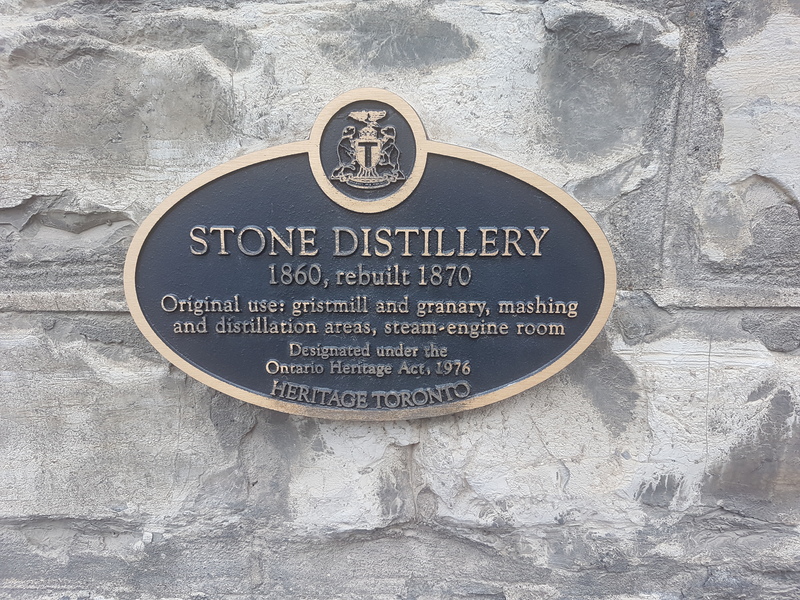 With the changes to Toronto’s waterfront, it has been forgotten that the Stone Distillery was steps from Lake Ontario. 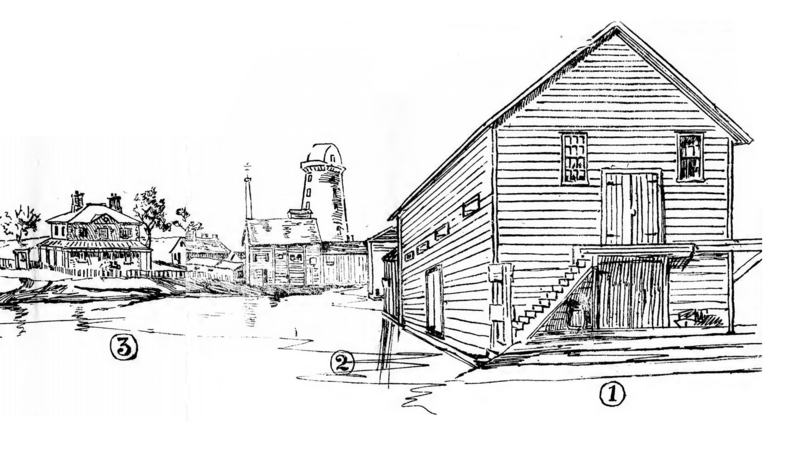 G&W also had its own wharf beginning in the 1840s, housing its grain elevator. 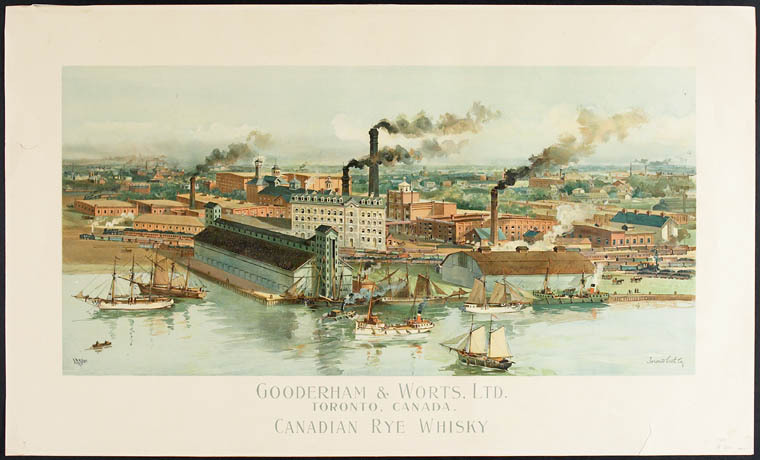 Gooderham and Worts from Barclay, Clark & Co. Bird’s Eye View, 1893. The elevator is right on the water to the south of the Stone Distillery. Credit: Old Toronto Maps. 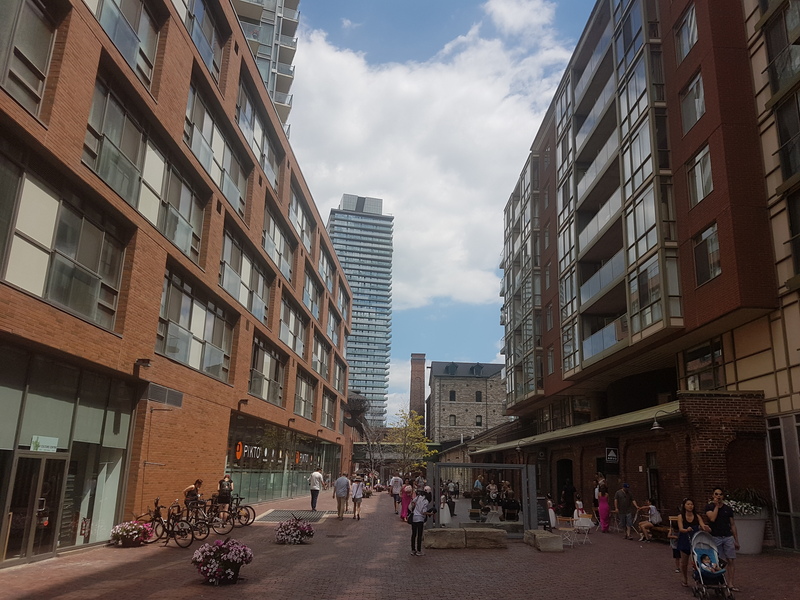 Since the closing of Gooderham & Worts Ltd in 1990 and its reopening as the Distillery District in 2003 by Cityscape Holdings, the area has been transformed into a pedestrian-only district, friendly for festivals and movie shoots. 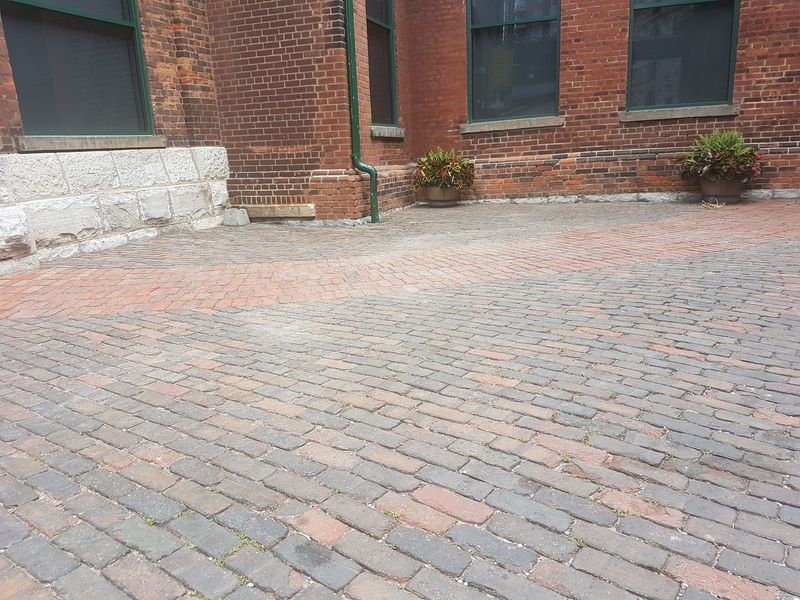 Although Trinity Street was gravel historically, bricks from Ohio were added for an old-time feel in its redevelopment — if you look close enough you can make out their origins on a select few. 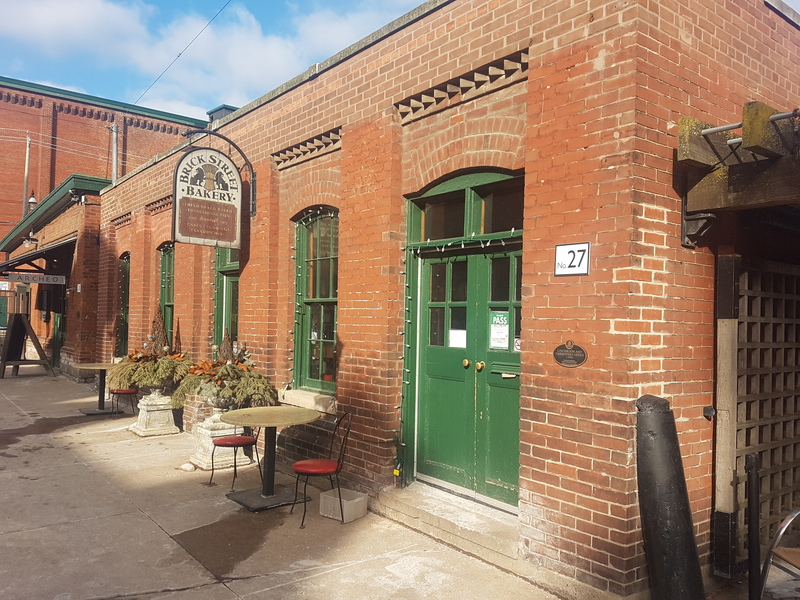 The buildings themselves have been repurposed to host cafes, chocolate shops, micro-breweries, bars, bakeries, and theatres. The area’s past is also nicely displayed throughout via heritage plaques and displays of artefacts, images, and paintings. Every turn produces some place of interest. 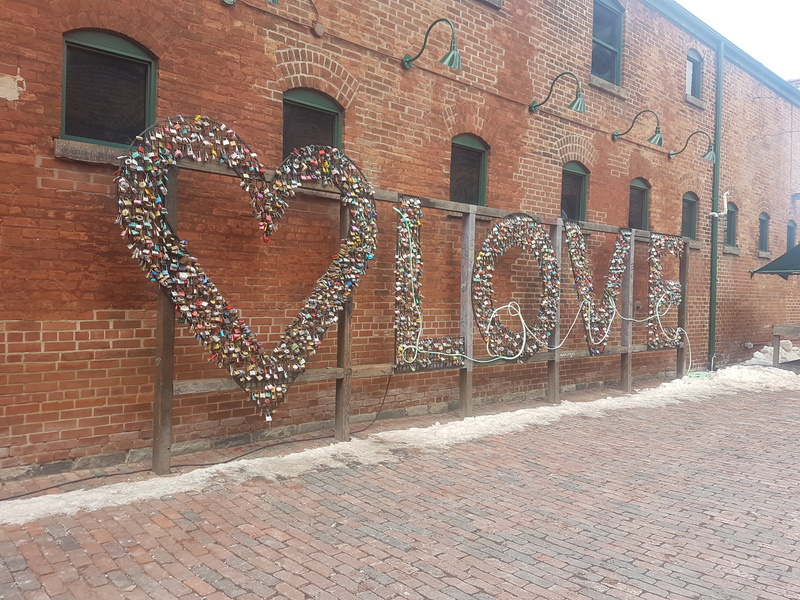 Favourites include the clock tower and the famous Love locks sign. Together with the buildings themselves, they create a distinct modern geography.